The Republic of Vanuatu consists of 83 relatively small islands, where people speak 113 languages. 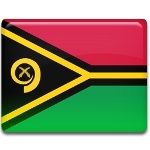 Unity Day, celebrated every year on November 29, was created to unite all peoples of Vanuatu into one single nation. Unity Day was established on November 29 to commemorate the events of 1977, that led to great losses of lives. In the early 1970's the first political party the New Hebrides National Party was established, it was renamed in the Vanua'aku Party in 1974. The party was primarily supported by the English-speaking population of Vanuatu. Later other parties, mainly supported by the French, were also established. Vanua'aku Party opposed other parties and proclaimed the creation of the provisional government in 1977. The leaders of the party tried to raise a flag over the headquarters in Port Vila, but this action was resisted by the police. The celebration of Unity Day should unite the numerous tribal groups of Vanuatu, that is why representatives of all Vanuatu peoples annually come to Port Vila to attend the festivals and watch the traditional dress parade. Ordinary citizens enjoy the day by camping or with picnics.